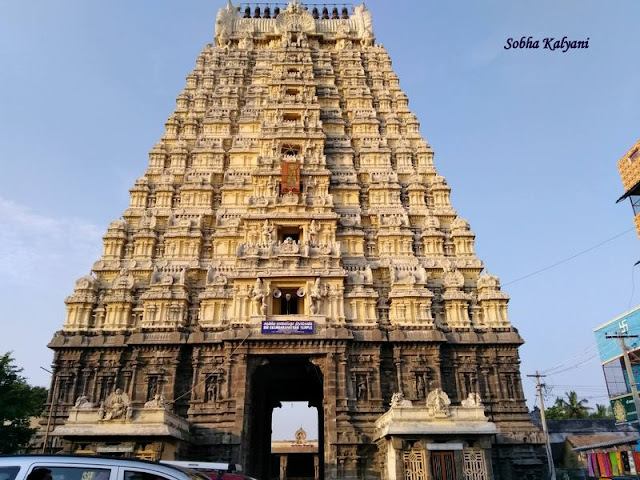 On Day 1 of our Tamil Nadu tour in October 2018 during Dussehra Navaratri we visited the temples of Kapaleeshwarar in Mylapore and Parthasarathy temple in Triplicane, Chennai. And on Day 2 of our trip we started early in the morning from Chennai in a cab and reached Kancheepuram by 7.30 a.m. At this ancient temple town we first visited the famous Varadaraja Perumal temple in Vishnu Kanchi and from there we went to Kamakshi temple which was heavily crowded with devotees as it was Dussehra festival time. It was afternoon by the time we finished our darshan and came out of the temple. We had our lunch in Hotel Saravana Bhavan, refreshed for a while and then proceeded to Ekambareshwar temple. Ekambareswar Temple known as Ekambaranathar Temple in Tamil is located in Siva Kanchi division of Kanchipuram in Tamil Nadu. The main deity of the temple is Lord Shiva who is known by the name Ekambareswar in this temple. The Rajagopuram i.e. the main entrance gate (South Gate) is one of the tallest gates in India, with 11 storeys and beautiful sculptures. 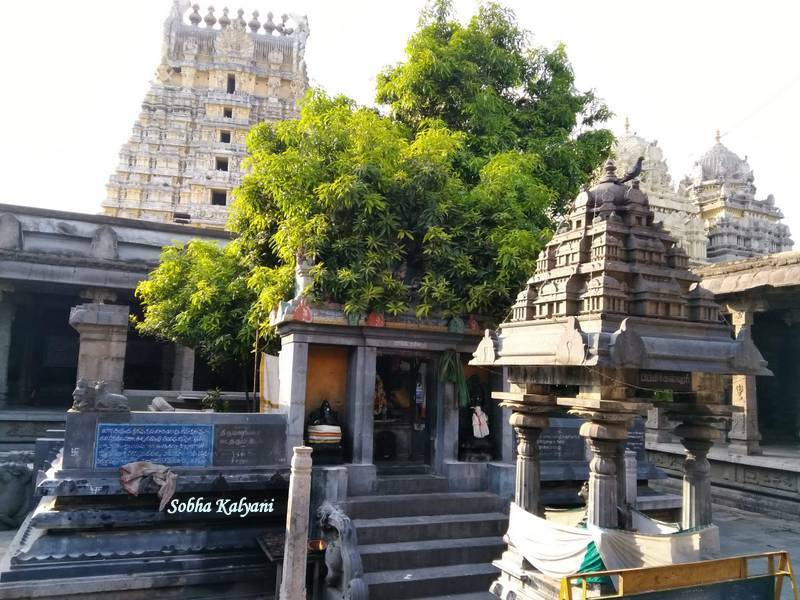 The temple dates back to 600 C.E (Current Era) and was rebuilt by Pallava, Chola and Vijayanagara kings. The main deity got its name from the 3500 years old mango tree inside the temple premises. The tree is considered highly sacred. 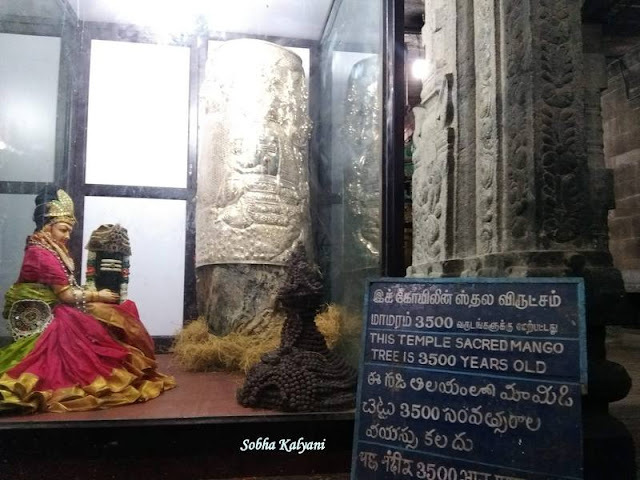 It is believed that Goddess Kamakshi (Parvati Devi) installed Siva Lingam made of Earth (soil) under one mango tree (one = ek in Sanskrit and amra = mango in Sanskrit) and worshiped Lord Siva to marry Him. Finally Siva appeared at this place and married Kamakshi Devi. 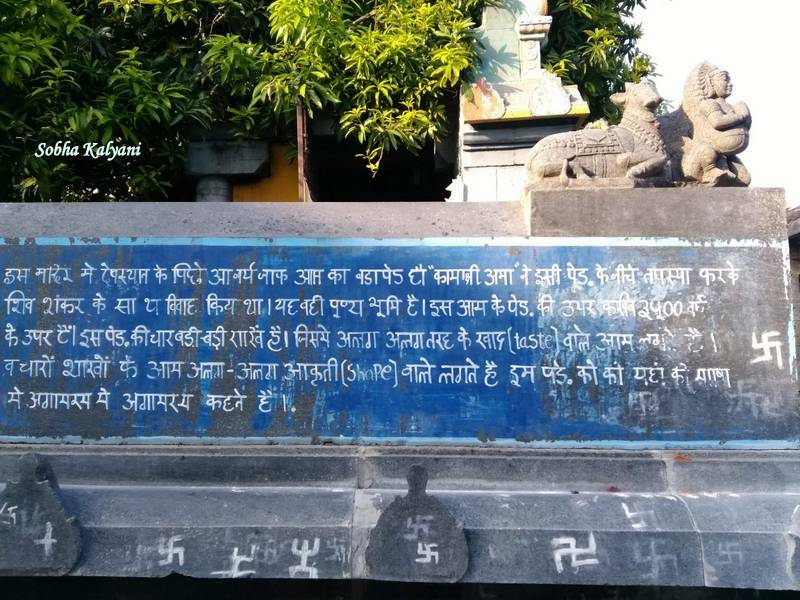 Thus Lord Shiva got the name Ekamreswar (Ekambareswar). And Goddess Parvati resided in Kanchipuram as Kamakshi Devi. This is one of the Pancha bhoota Shivalinga temples in South India. It is Prithvi Lingam (made of Earth / soil). As this is a Prithvi Lingam 'abhishekams' i.e. pouring of water / milk on the lingam are not performed here. On entering into the main gate, there is a long walk way to reach the main temple. At the entrance of the main temple, there is a depiction of Goddess Parvati / Kamakshi worshiping Prithvi Lingam. 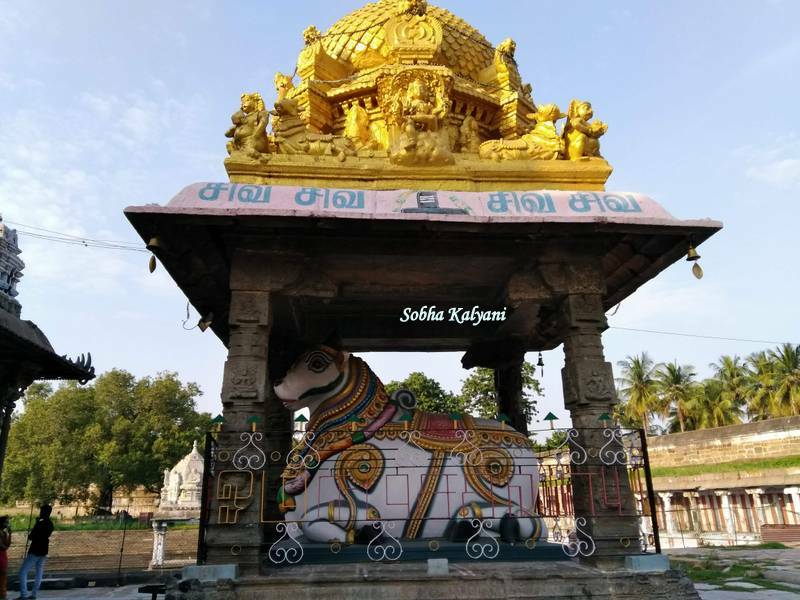 And Nandi (the Divine Bull) facing the main entrance of the temple. And a Pushkarini i.e. the temple tank on one side. It is a vast and spacious temple with typical ancient Dravidian temple architecture. 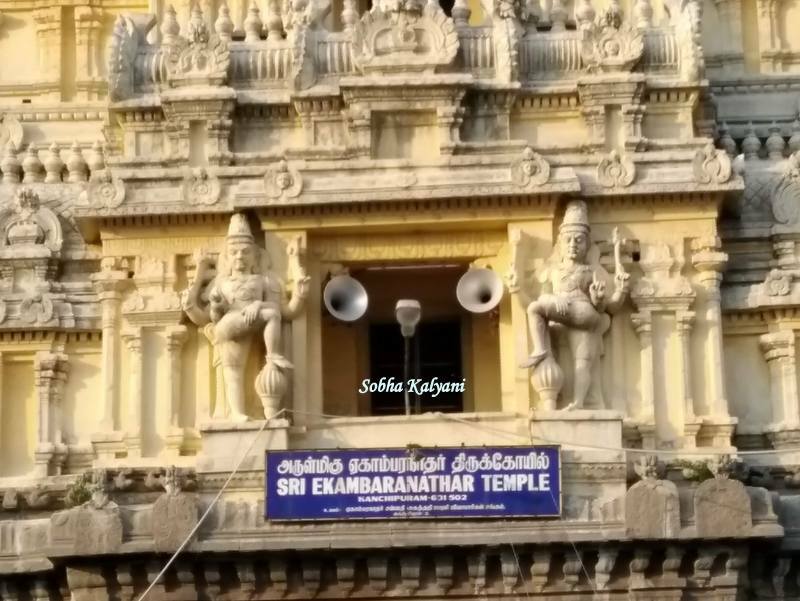 The temple is located at Ekambaranathar Sannidhi Street, Periya, Kanchipuram and is at a distance of 2 Km from Kanchi Bus Station. It is at a walkable distance from Kanchi Railway Station. The temple remains open for devotees from 6 a.m to 12.30 p.m. It remains closed in the afternoon and again remains open from 4 p.m to 8.00 p.m. Almost all the ancient and medieval temples in Tamil Nadu have similar architecture. There will be four main entrance gates in four directions with high compound walls. Inside the temple premises there will be long corridors on the four sides of the main temple. On either sides of the corridors, there are row of rock pillars on raised platforms. The temple architecture in these ancient temples is marvelous and spell bounding. The meticulous sculpting work on the rocks in the ceiling, on the walls and pillars is astounding. Visitors cannot stop themselves appreciating the ancient Indian artisans who sculpted the rocks into extra-ordinary art pieces. Pilgrims can take cameras, videos, cell phones inside the temple premises but they are prohibited to take pictures of the main idol in the sanctum sanctorum. There is lack of proper maintenance in the temple. It would be nice if the temple authorities uplift / develop this ancient temple of great importance so that it could attract more number of visitors and pilgrims. Kanchipuram / Kancheepuram / Kanchi is an ancient city in South India presently located in Tamil Nadu. The city is nearly 72 Km from Chennai. 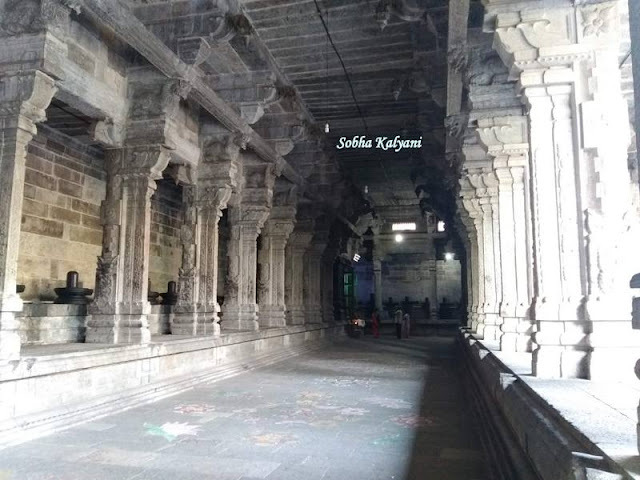 Kanchipuram remained the capital of Pallava Kingdom from 4th century C.E to 9th century C.E. Later it was ruled by Cholas, Pandyas and Vijayanagara kings. 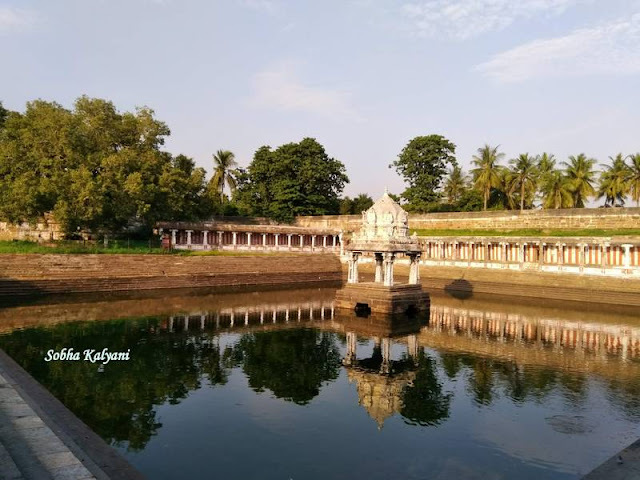 It was known as Conjeevaram / Kanjivaram during the British rule in India. 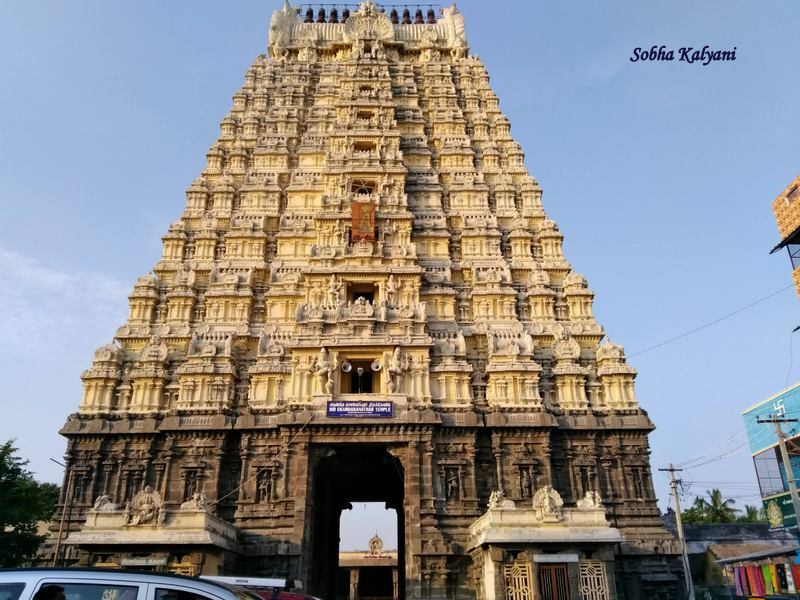 Kanchipuram is the headquarters of Kanchi Kamakoti Peetham / Matham founded by Adi Shankaracharya. Kanchipuram flourished as a centre for advanced learning of Hinduism, Jainism and Buddhism between 1st century and 5th century C.E. The city is world famous for its finely woven pure silk sarees. It is a traditional centre for silk weaving and handloom industry. The city is famous for ancient temples which include Kamakshi temple - one of the 18 Shakti Peethams (ashtadasa Shakti Peethams), Varadaraja Perumal temple in the Vishnu Kanchi division of Kanchipuram, Ulaganatha Perumal temple and many more. All these temples remain closed from 12 noon to 5 p.m. So pilgrims / devotees who visit these temples need to plan accordingly. 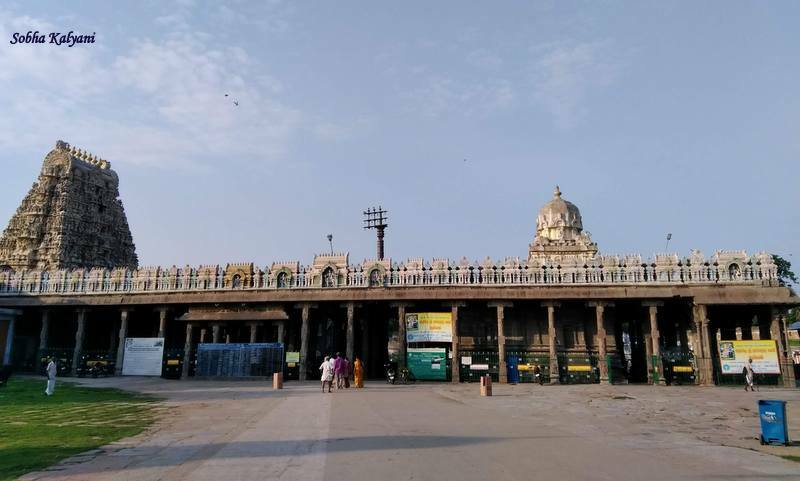 The part of Kanchi where Varadaraja Perumal temple is located, is known as Vishnu Kanchi while the part of Kanchi where Ekambareswar temple is located is known as Siva Kanchi. The climate of the city remains hot and humid through out the year.